At Stephen Gelly organic farm in Cornwall we organically farm 120 acres of permanent grassland in the middle of Cornwall. We recognise our responsibility to care for our environment. 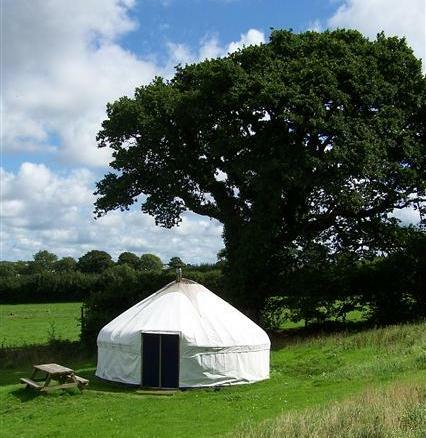 We welcome visitors who have a choice of accommodation; self catering in a family sized Yurt or B&B in the farmhouse. If you choose to visit, you can experience life on a farm where we strive to be self sufficient. Live close to nature and observe the different farming enterprises at work and sample our organic home-produced food. See our website, we are located in the centre of Cornwall and are ideally situated as a base for exploring the rest of the county. We keep bees to pollinate our fruit trees and bushes, and of course to produce surplus honey. We pump spring water to a reservoir which supplies the farm buildings and every field. For over 20 years the farmhouse has heated water by solar panels on its roof. We are currently installing PV panels on a barn roof to produce electricity to run our cold room. We use solar powered fences too, for our pigs, hens and growing chickens. We heat our homes with wood-burning stoves. The logs are a by-product of our hedge and woodland management. Small branch pairings are made into charcoal. We reuse and recycle, so come and see some of the results! Our large vegetable garden needs a lot of attention, help (from WWOOFers) is appreciated. There is a long list of home produced foods available, to our customers and visitors, in season. Direct selling organic meats and eggs to local customers is our main business. Calves and lambs are born and reared on our farm and chickens are reared here from a day-old, so all produce we sell has very few food miles. For further details and information please visit the Stephen Gelly Farm website.